Scorching Slots is a sizzling new Nektan casino that was founded in 2018. This online casino is licensed under the United Kingdom Gambling Commission and the Gibraltar Regulatory Authority, which ensures players that it is a safe and fair betting platform for customers to enjoy. Scorching slots is more niche in comparison to other Nektan casinos in terms of variety of games, however it is still a great casino that can offer some top bonuses to its players. In this casino review, we will take a look as to why this casino is such a great place to experience some of the best casino games and what it can offer customers. Every so often, Nektan decide to not just go with a simplistic themed slot and put time and effort into the look of a casino, Scorching Slots casino is a perfect example of this. The background of the casino is very creative, it features gusts of smoke, dark mountains and also shadows of dragons that can be seen through the mist of smoke. As far as aesthetics go, this is one of the best-looking casinos of all Nektan casinos and it encourages customers to want to play here. All the content on the casino is laid out similar to any other Nektan casino, at the top of the page, there is the Scorching slots logo as well as the Scorching Slots login options. Under this is the slideshow banner of exciting bonuses and exclusive games for customers to experience. These bonuses are very tempting for players and encourage players to want to join. There is no menu section down the left-hand side of this Nektan casino, which is unusual for a Nektan site. Instead, there are category tabs across the top of the games section, labelled as: Player Favourites, New Games, Jackpots, Recommended, All Games and also a search bar which allows you to easily locate any game specifically. Underneath that you can see all the thumbnails to some of the most popular casino games that Scorching Slots has to offer customers. If you scroll past the long list of games, you will make your way down to the bottom of the casino, where you can see the range of payment options, licensing certificates and also quick links to certain pages of the casino. As it is one of the more basic Nektan casinos, there is not the biggest gaming developer’s selection of any Nektan casino, although there are still a lot of the top software providers in the industry listed in this casino. These developers are proud owners of some of the best casino games in the industry and allow customers to have an excellent gaming experience from playing their casino games. Some of the most popular software providers included in this casino are: Netent, Microgaming, Blueprint, Big Time Gaming, Nektan, NYX, Konami, IGT, Lightening Box, Gamevy, Elk Studios, Scientific Games, Spin Games, Realistic Games. Experienced players will have come across some of these top brands before. In terms of promotions, there are a couple of awesome bonuses for customers to take advantage of, but again, this is an area of the casino in which Nektan have simplified in comparison to some of their other casinos and there is not much variety in terms of promotions. Nektan have kept it simple to a welcome package for new customers, and a VIP Club for existing customers. 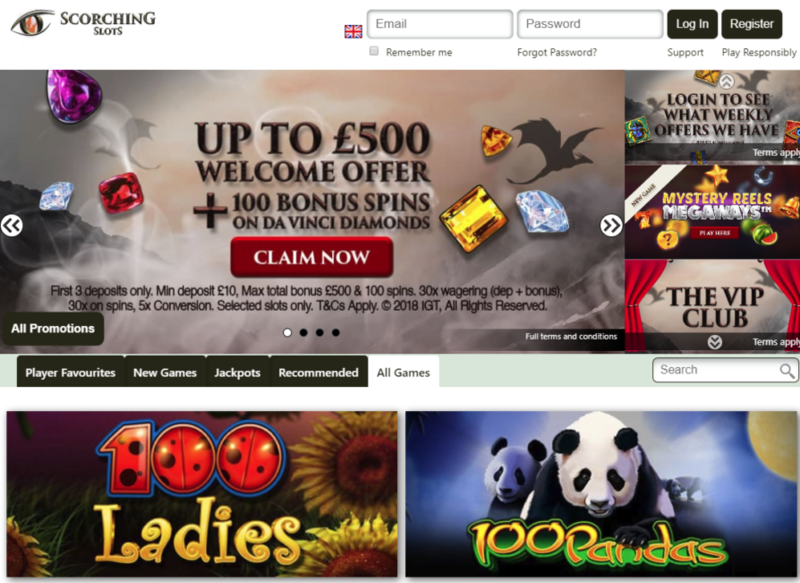 Starting off with the welcome bonus, Scorching Slots can offer new customers up to £500 as part of a welcome package, as well as 100 free spins on Da Vinci Diamonds slot game. This is a different bonus to other Nektan casinos, first off, the cash value of a Nektan bonus can vary, and although it is not the highest cash value, they have chucked in 100 free spins to play on one of the best slot games in the industry. Usually it will be the case that the free spins are to be activated on Starburst, as that is the case for most Nektan welcome bonuses, but it is nice to see that there are other options for customers to take. The other promotion that applies to existing customers is the VIP Club. The membership you have in the VIP Club will determine the rewards that you get out of it. There are 4 membership rankings in the VIP Club: Silver, Gold, VIP Premier, VIP Elite. The different types of benefits that you can get include: Account Management, VIP Welcome Bonus, Enhanced Promotions, Anniversary Bonus, Monthly Bonus, Birthday Bonus, VIP Hospitality. The level of membership you have will determine which benefits you apply to. As we mentioned earlier, in a sense, Scorching Slots is kept quick niche and doesn’t have the widest variety of casino features that we have seen of other Nektan casinos. This does not mean to say that they don’t offer anything at all. There are still over 200 different games for players to try out. These are some of the best casino games in the industry and therefore still ensure you the best casino gaming experience. It is not just slots that you can play at this casino, even though it may seem like it from the title. Customers can also experience a range of table games, live dealer games, and more. In order to locate the different forms of support available at this casino, you can open up one of the support tabs, which are located at the bottom of the casino and also at the top, underneath the log in options. Once you click on this tab, a box will open up, displaying all the different support options, which include: Live Chat, Telephone and Email support. Live chat will put you in a 1 to 1 chatroom with a member of team, when messages can be responded to quickly. Telephone lines are open between 8am and midnight, 7 days a week. Email support is open 24 hours, although it can also take up to 24 hours to get a response. Overall, the customer support team at Nektan have been known to be efficient. Nektan casinos provide their players with the same range of payment methods across all their casinos. This range of methods is a suffice list that players should be pleased with. They offer both card payments and also e-wallets to their customers. The available payment options at this casino include: Visa, Visa Electron, Maestro, Mastercard, PayPal, Skrill, Neteller, Paysafecard, Boku, Trustly, Zimpler. To conclude our thoughts on Scorching Slots casino, it is simple but effective. It is an exciting casino to play at, that has a great selection of games and also a very aesthetically pleasing casino website, which is always a positive to encourage players to play. This casino is mobile friendly and therefore can be accessed on smartphone and tablet devices. Customers can sign up now and claim the welcome bonus, enjoying this casino to its full potential.